I have finally had enough time to muddle through the 2012 MLB transaction data and have compiled a complete disabled list (DL) data set for the year(second link). Let’s get right to the data. – The Padres take the crown for most days lost with a total of 1883. The Padres lost almost 4 times as many days as the Mariners (452). 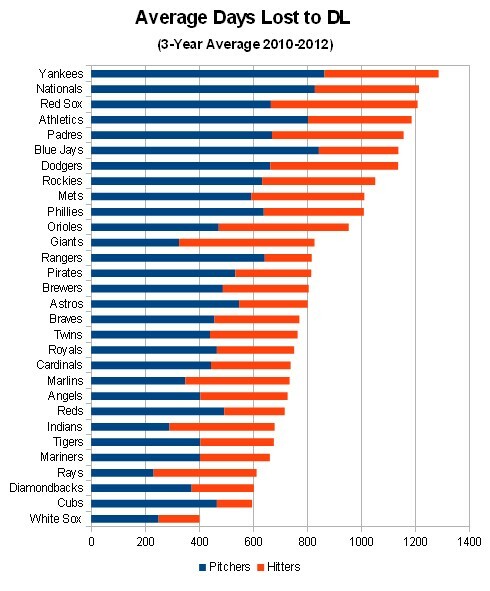 – Looking at just pitchers, the Yankees lost the most days with about 200 more than the Padres and Blue Jays. The Mariners and Rays were effectively tied at the bottom near 200 days. – With batters, the Orioles and Padres lost the most days with the Red Sox 20 games behind. – The most surprising fact I found in the data was the Twins only losing 53 days to their hitters. To put it into perspective, Morneau (93 days), Mauer (74 days), and Doumit (65 days) each spent more time on the DL in 2011 than all the Twins hitters did in 2012. 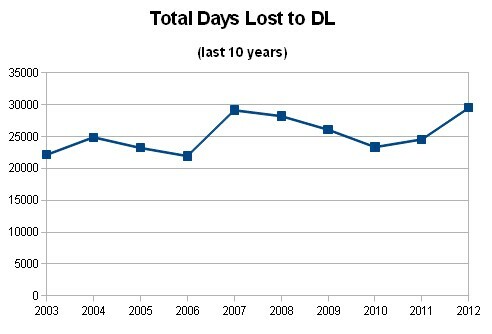 – More days were lost to the DL in 2012 (29,534), than in any previous season. The previous high was in 2007 with 400 less days lost. Here is a quick look at the trend over the last 10 years. – Again, the White Sox are near the bottom of the list. To put it into perspective, here are the 3-year averages for days lost per team. The lack of days lost by the White Sox, compared the rest of the league, is incredible. Over the last 3 years, the White Sox have averaged 400 days lost. The next closest time is the lovable Cubs at around 600. 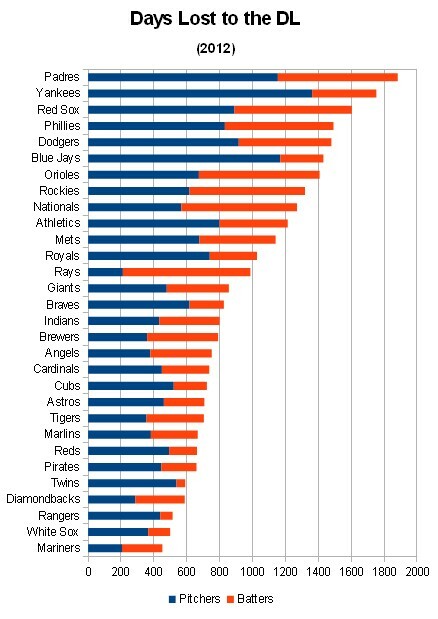 The Yankees, Nationals, and Red Sox have lost on average 3 times as many games per year over the same time frame. The reason for the difference could be long time White Sox trainer, Herm “Teeth Crusher” Schneider. He has been the White Sox trainer for 34 years and has done an amazing job of keeping players on the field. There’s almost certainly some good luck in there as well, but kudos to Schneider on a pretty incredible run of health during his watch. h/t to Chris Cwik for the Herm Schneider story. We hoped you liked reading 2012 Disabled List Summary by Jeff Zimmerman! Is this pitchers in general or just starters? By my count, 302 of those games alone are accounted for just in Pineda and Rivera.